I’m taking a break from my Looney June posts to bring you guys a VERY special post. But before I get on that, I have to tell you something. Today is not a good day. I am depressed. Depressed. Depressed. I had an interview today and it went well. The interviewer even registered me for my online training, problem is that the internet is so bad here that I can’t get into the online classroom. I had to email them to cancel everything. I can’t do the stay at home job if my internet is crappy. I only have one other lead. My best friend used to work with one of the nearby library branches and he put in a good word for me. Not only that but my mentor from grad school also let me list him as a reference. This would be a dream job for me. If this doesn’t work out, I’ll have to bite the bullet and do something I’m a bit iffy about. I wanted to apply to our local library branch as soon as I moved here. But when I looked up the information I discovered the process is quite grueling. The wannabe employee has to take a test. I don’t mind taking said test, but I couldn’t understand how you’re supposed to register to take it. Not only that, but you’re actual application is also a test. So, any mistakes you may make on it will count against you. It just sort of frightened me. While the library I have just applied for is just a little bit further out and all they require is an application. But I have to do what I have to do, so if this doesn’t work out, I’ll take the rough application step by step. Now, we’ll get to what I really want to talk about. Let’s go back to that best friend I just mentioned. His name is Patrick and he doesn’t really know it, but he has saved my life more times than I can count since I met him as an undergrad. If I actually get this job through him, he can add another one to the list. Maybe he’s my guardian angel or something. Anyway, Patrick and I are children of the 90s and we both have a VERY deep love of the culture of that decade. Patrick also knows that my two favorite bands are the Red Hot Chili Peppers and Everclear. He even bought me a blue Everclear shirt for Valentines Day. I hope you enjoyed that little musical interlude. Patrick decided that this year for my birthday he would purchase us tickets to see Art Alexakis (lead singer of Evercear) play solo. For those that don’t know the band, he writes all the lyrics. Art Alexakis is the mastermind behind the hits “Father of Mine,” “I Will Buy You A New Life,” and “Santa Monica.” Those are just a few of the big ones. That show took place on June 6, 2015. Patrick, my fiance, and I arrived an hour before the show. At first, we stood outside the door, taking pictures of Art’s poster. Then Patrick went in to see if we could all go in early. When he came back out, he was full of excitement. At that point, my heart was pounding in my ears. Would I have a chance to meet the man that got me through so many hang ups and break ups? I couldn’t possibly wrap my head around it. But when we were allowed in, a man came down the stairs, hobbling in a cast and carrying a cane. 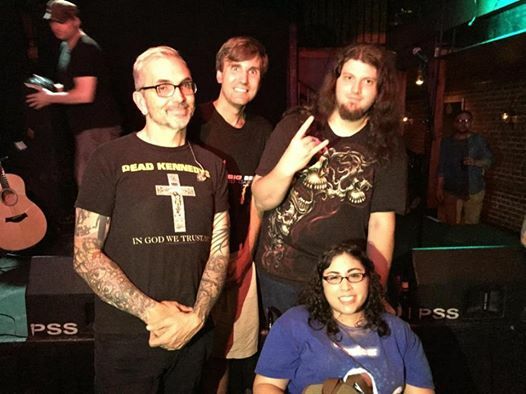 This was Art Alexakis and he was touring with a broken leg. Dedication. I laughed. “I really love Everclear! I’ve been a fan ever since I saw the Father of Mine video.” I’m sure all my words came out in a rush. I was 8 years old when So Much For the Afterglow came out. 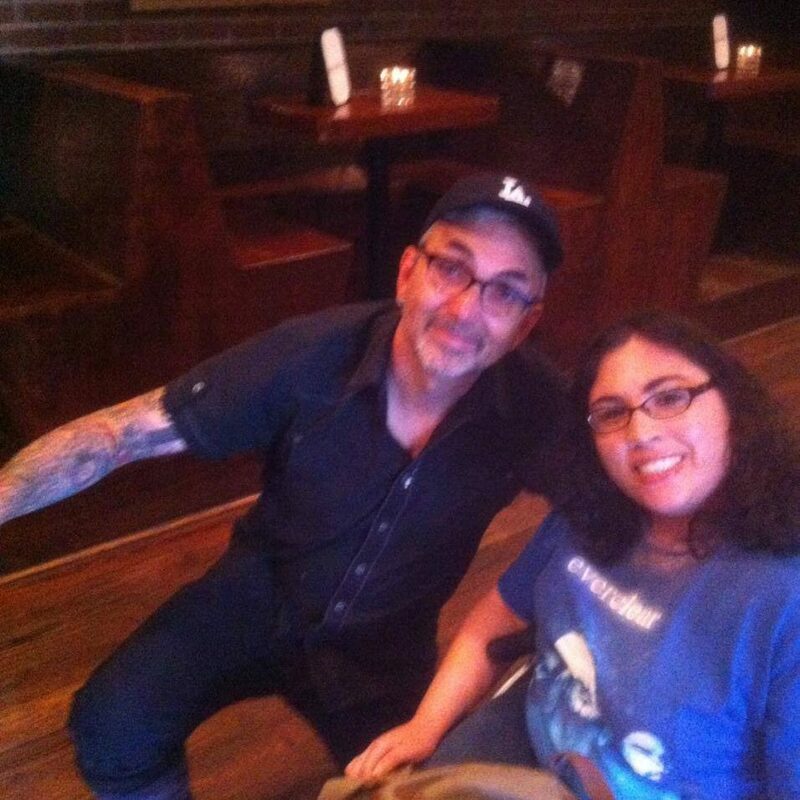 Art Alexakis knelt down with a broken leg to take a picture with me. And he did. Just for me. After the show, everybody was running to see him. I wanted to talk to him again. I was so starstruck the first time and I wanted him to know what his music meant to me. But I couldn’t be a fan hog either. That’s not cool. However, other fans decided to start moving chairs and the crowd parted for me. I was really amazed I hadn’t started crying. He looked at me again, knelt down, his ear to my face. I could have kissed his cheek. We got one last photo. The Blog Tour: My first nomination! When I logged on this morning to check out what my fellow bloggers had written since yesterday, I discovered that I had received my very first blog nomination! I want to thank the writer at https://acaffeinatedblog.wordpress.com/ for inviting me to this blog tour. Let’s start with the Rules: Pass the tour on up to four other bloggers. Give them the rules and a specific Monday to post. Answer four questions about your creative process that lets other bloggers and visitors know what inspires you to do what you do.Compose a one-time post on a specific Monday (date given by your nominator). 1. What I’m working on at the moment? At the moment, I just want to get out of graduate school with my Masters. Here and there, my fiance and I are trying to wedding plan though. But that process has had a few bumps in it. I don’t really have a set genre. This blog was really made to chronicle my life with my husband to be and my love of pop culture. Though most of the time those take a backseat to skin care, my own writing, book reviews, graduate school, and ranting. So, really this blog is about my life and everything that goes with it. One day I could be posting a piece of own writing, a book review, a skincare review, a movie review, or just my thoughts or what I did today. Life is like a box of chocolates, you never know what you’re gonna get! 3. How does my writing and creative process work? I really don’t have a creative process. I just take whatever I want to write about and go. The editing happens after the free write. Sometimes I like a little music in the background though. 4. Why do I write and create what do I do? If you asked me what my main inspiration was I would have to say it is my husband to be. I started this blog as a way to chronicle my life with him and how he “ruined me in all the right ways.” I wanted other disabled people like me to know that we are not doomed to be alone forever, as I once so foolishly thought. I would say another big inspiration is other writers and my bookish nature. 90s pop culture is probably my second favorite thing to write about besides my partner. I grew up in the 90s grunge era and was always a big fan. But I just love the decade in general. In fact, the title of my blog comes from the Everclear song; “Rocket for the Girl” from their 2012 album Invisible Stars. If you wish to participate, and I hope that you do, please answer the 4 questions listed about that I’ve answered. You can answer them anytime that you’d like as I don’t have a certain Monday in mind. Have a great day!